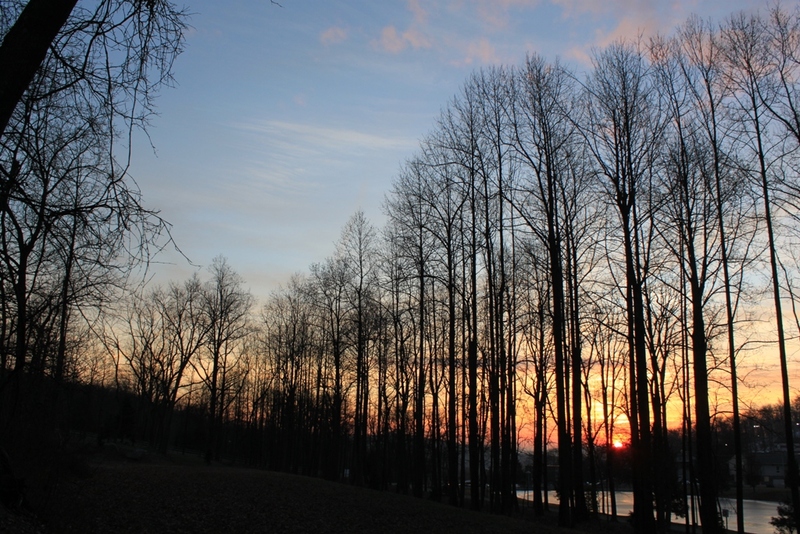 December’s wrath is disappearing, a few degrees at a time. 2011 will start off rather warm and I won’t mind even a little bit. Of course, if the warmer temperatures last for longer than a nice winter breather, I will begin to fret again. For a few days, however, it’s a most welcome relief. My plans for the new year are nothing unusual. I will have the traditional Pennsylvania New Year’s dinner of pork, sauerkraut and mashed potatoes. I will bird as much as I can on both January 1 and 2. The start of the new year means the start of a new bird list, and I’m determined to get my 2011 county list off to a good start. For much of 2010, I was the #1 birder in York County, according to Cornell Lab’s e-bird, but limited birding opportunities, especially in the fall, dropped me well behind the two who are now ahead of me. I am determined to regain my #1 spot, though competing against a retiree and footloose young man will not be easy. So I want to get 2011 off on the right foot with as much birding as I can fit in over the upcoming holiday weekend. The warmer weather should help my cause, though rain on Saturday won’t. I have a nice advantage with woodland birds, since I live in a forest, but shorebirds and waterbirds are my downfall, since that means I have to somehow find time to drive to the river or a large lake to add them to my list. And I don’t seem to be able to do that more than a few times a year. But this new year I will start off with trips to the river and a lake or two, looking for open water and seeing what I can find. I will never have the means to even attempt a U.S. “big year,” and even a Pennsylvania big year must wait until I can retire. So until then, I will have to content myself with regaining my county crown. The race is on! The big northeast blizzard pretty much missed me here Roundtop Mtn., though I was stuck with 50+ mph winds for several days. The forecast called for 6-10 inches of snow, so I feel safe in reporting the prediction was wrong. Snow showers were about all I got. I should point out, though, that the forecast was only off by 20 miles or so. With these kinds of storms, figuring out the track of the storm is the tough part. Once the wind kicked up, the forest simply howled. I heard trees cracking and had branches fall into the driveway and the lane. Last night one branch fell on the steep-pitched roof and rolled down the whole way, sounding like a herd of elephants and rousting the dogs’ ire but causing no damage. I don’t do wind well, I’m afraid. Go ahead and call me a wimp. Living in the forest, I am more concerned about wind than any other natural problem. I retreated to the coziness of the cabin and only came out to quickly run the dogs. But we all made it through, and now, after one of the colder Decembers on record (might make the top 10 coldest here), I am ready for the warm up. The warm-up won’t be enough for me to bring out the t-shirts and will only result in warmer than normal temperatures for a few or maybe several days. But after the first 3.5 weeks of December that already sounds heavenly. Perhaps I have blamed Pig the raccoon for more than his share of my bird feeder destruction. After many nights of being awakened to the sound of Baby Dog baying in outrage at the raccoon on the back deck, I have simply blamed all such nightly forays on him. 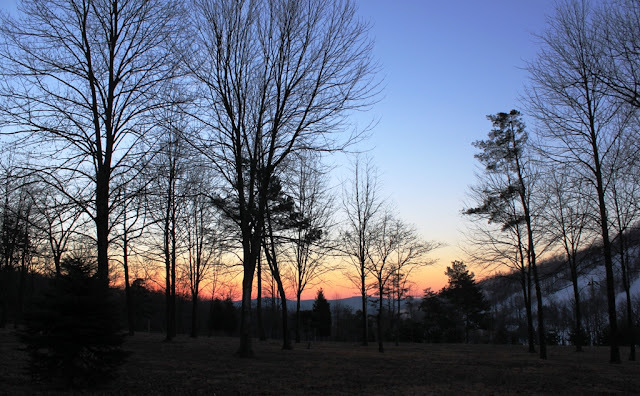 Then last early this morning, a bit after 5 a.m. when it was still dark but lit by the full moon, I saw a gray squirrel leap from the oak tree next to the cabin onto the tube feeder. The distance must be more than 10 feet, and the leap took everything the squirrel had. His little hindquarters pushed for all they were worth as he launched himself at the feeder, which obligingly fell to the deck in the face of the squirrel landing on it. So I’ve maligned poor Pig, at least some of the time, when the fault is not his. Now if I can only figure out what is rousting the chickens at 3 a.m., perhaps I will eventually get a full night’s sleep. Solstice, a full moon and an eclipse. If I had lived 372 years ago, the last time this phenomenon occurred, I would likely have assumed that combination portended something important. As it was, I simply set my alarm and got up just before 3 a.m. to view the extraordinary event. Did you? The moon was an orangey-red; for me it was not the blood red I’ve heard described elsewhere. I couldn’t view it for the entire time of the eclipse as the moon dipped into clouds within several minutes. Still, it was well worth the wake-up alarm. A few years ago I discovered I have my own personal and naturally-occurring “stonehenge” or at least a solstice display. Only at winter solstice does the sun set directly between the two trunks of the old oak behind my cabin. The druids would be pleased, as am I. Now the sun will set further north each night. It will travel up the mountain, past its rounded peak, down the other side, up the side of Nell’s Hill, and reach past that rounded peak by the summer solstice. Some years, I don’t get to take my solstice photo because of poor weather. This year, the sun set just right, and I was able to watch the sun dip towards the horizon, right between the two trunks. 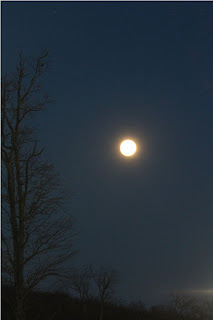 I was happy enough that this year’s solstice brought a full moon to soften the depths of the Long Night. In older times, bonfires were lit and burned through this night. With the full moon traversing the sky, a bonfire was hardly needed last night. The long night seemed much less fearsome with that huge moon above the cabin. 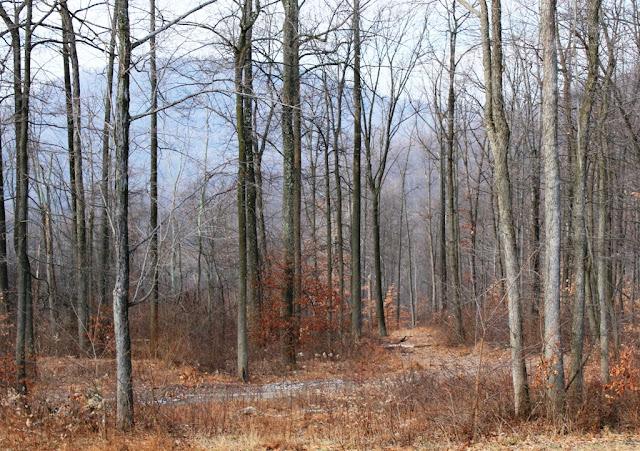 The forest is brown and bare and still. 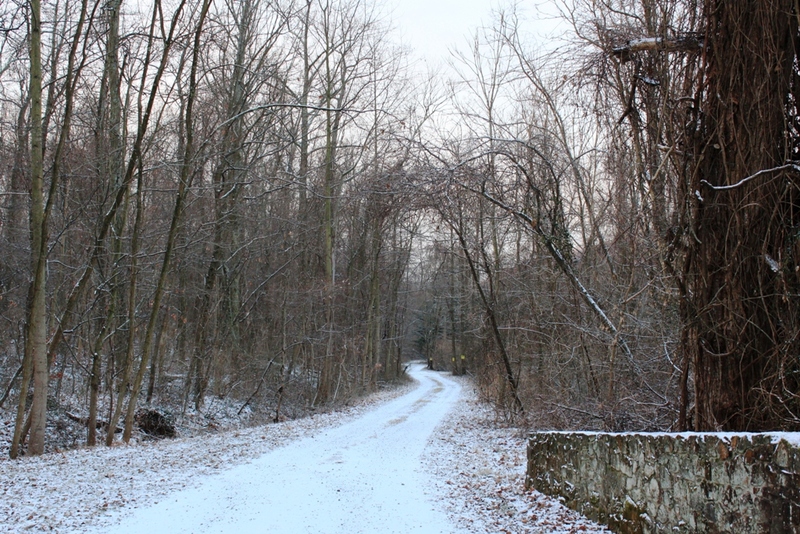 The winter season is in its early phase; the dusting of snow only dots the old woods road. Perhaps this will be a winter with lots of snow, perhaps not. 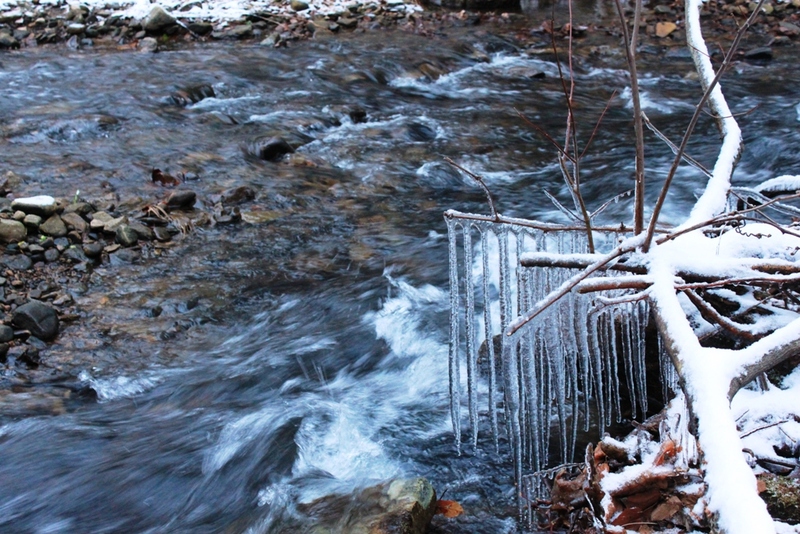 The chill of winter hangs in the air whether or not snow falls. Winter is a dry season here, so the cold is more reliable than the snow. 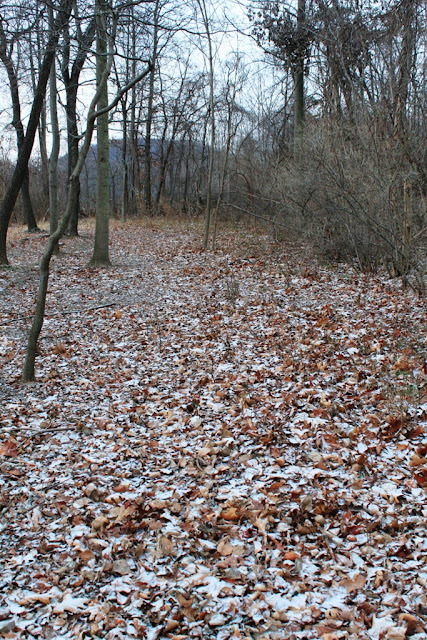 The ground is frozen and makes walking more difficult. Every invisible little bump threatens to turn an ankle or cause a misstep when I walk off a trail. The flattened grasses and leaves hide the bumps or holes, and I feel as though I am trying to balance on marbles simply by walking across the old field. I slow down and move more carefully, though that slowness allows the cold to creep under my jacket. The ponds are frozen, if not yet frozen deep enough to walk on. Dog and Baby Dog eye the ice suspiciously. Dog heads down to the edge of the pond, as though he wants to attempt it. He chooses the wrong spot, where the remains of some summer plant creates a bloom of ice with open water behind it and the sound of rushing water underneath. He steps on the bad ice. It cracks and he retreats. Perhaps if he’d chosen a spot where the ice was smooth and clear... Perhaps tomorrow he will try again. A trace of snow covers Roundtop Mountain and the low valley between the mountain and the orchards. In the early morning the old road looks especially wintry today. The old road winds along Beaver Creek, following its every curve, rising and falling a bit where the creek dives into a deeper spot or where the banks are too steep for a path, let alone a road. In summer and fall I walk this road regularly. Few vehicles ever pass and those only the Roundtop crew heading over to check on a pump or a well. So when I walk it, I have the mountain to myself. In snowy weather, I walk it less frequently, perhaps just 2-3 times over the winter. The valley holds the cold as close as a lover, and the paths are icy. The hours of daylight are short, too, which lessens the time to get in and out again before dark. Even in this time, though, the road calls to me. That curve up ahead, where the road disappears into the forest, draws me like a magnet. How can anyone resist the call of a road that winds into the woods, with a hint of still-invisible wonders up ahead? Even though I know every curve and hollow, every rise and fall of that road, it still draws me in. Ahh! Rifle season for deer is over, and the brutal wind that has torn across Roundtop Mountain this week has diminished. This morning the dogs got their normal walk in the woods instead of the shorter one that kept us all away from spots where the hunters sat. And despite the 14 degree temperature, without that wind this morning’s pre-dawn walk was both comfortable and enjoyable. The dogs were wild of course. Shorter walks for nearly two weeks do not make for calm dogs. Snow showers flit across the mountain today. Sometimes I can see by the clouds that snow is falling, but it doesn’t always reach the ground. By Saturday the temperature might even break freezing for the first time in a week, but I’m not going to hold my breath on that one. The chickens’ water freezes solid overnight and freezes pretty solid during the day. I have two waterers for them and switch them out between morning and evening. The chickens are usually all on the roost when I switch out the water in the evening, so I don’t know if they have a chance to drink much of before it freezes solid. I don’t have electricity out to the chickens, and I’ve tried so-called solar sippers, but the bottom line is the girls don’t have many hours of opportunity to get a drink before the water freezes. This winter is supposed to be a la nina year, which in this area typically means a winter is warmer and wetter than normal. So far neither of those things are true, but I’ve been around long enough to know that a cold start to the winter in December doesn’t necessarily predict anything about the rest of the winter. Warmer and wetter than average could still be the case later on. At this point, I’d be happy with less wind and more sunshine. We do appear to be making progress on the less wind part, but not so much with the sunshine. Cliches usually have some truth in them. I was reminded of that this morning when I saw the sky—a leaden sky. The sky is the color of lead and even looks as dense as that metal. 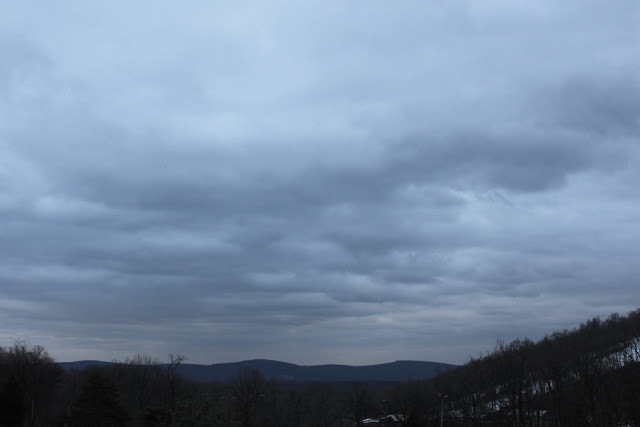 It’s a cold, uninviting, winter sky, portending snow or freezing rain or something that feels damp and miserable. So the term may be a cliché but it also holds truth. Looking at the overcast sky reminded me of how I predicted snow when I was a kid. We lived in town then, and across the street was a duplex with a tin roof. Whenever the sky turned the exact shade of gray as that tin roof, it was about to snow. In my memory, that trick never failed. The sky never turned that shade of gray in summer, even before a summer storm. Only in winter did the sky reach the perfect shade of tin roof gray. This morning, to my eye, the leaden sky is just a few shades too deep a gray to mean snow is about to fall from it. It needs a few more hours yet to “ripen” into the right shade, but it’s working itself into that direction. We’ll see what happens. Virtually every kind of precipitation there is fell out of the sky today. By dusk the precipitation was rain. Most of the day was foggy, as you can see from the photo I took earlier today. It was the kind of day that demanded cups of hot tea and a couple of wet walks in the woods with the dogs, followed by a sit in front of the fire. In other words, the day was a bit lazy, perhaps lacking only a nap to turn it into a full-scale kind of lazy day. Even the chickens weren't inclined to wander outside their pen, though the gate was open most of the day. The dogs didn't mind the wet weather, at least not enough to want to stay inside when offered the chance for a walk. Our forays produced a few surprises--a robin scolded us, the flickers I hadn't seen for a few weeks skittered in front of us. Wait, a robin? Where did that come from? Canada, perhaps? Unhappy with me or the dogs, the bird scolded as we passed. The flickers are less of a surprise, but still a pleasant sighting after not seeing them for a while. We didn't see anyone on our walks, which given the weather, is hardly a surprise. Where I like to walk, it's rare to run into someone even in nice weather. And on those few occasions, the human is likely to be a ski resort employee on some errand or another. 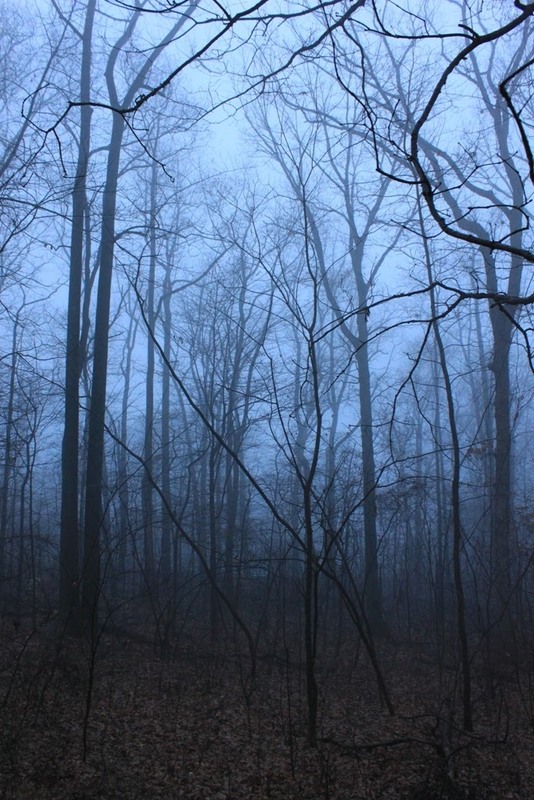 But today there was none of that, just me and the dogs, the wet and brown woods and the fog. Winter arrived about a week earlier at Powerdermill Nature Reserve (where I took today’s photo) than it did at my cabin on Roundtop. These icy stalactites already look as though they are ensconced for the winter, though they can’t have formed more than a few days, perhaps a week, before I took the photo. The weather was still pretty warm in late November, though I am sure up in the hollow where Powdermill Creek runs, it would be colder there than elsewhere. 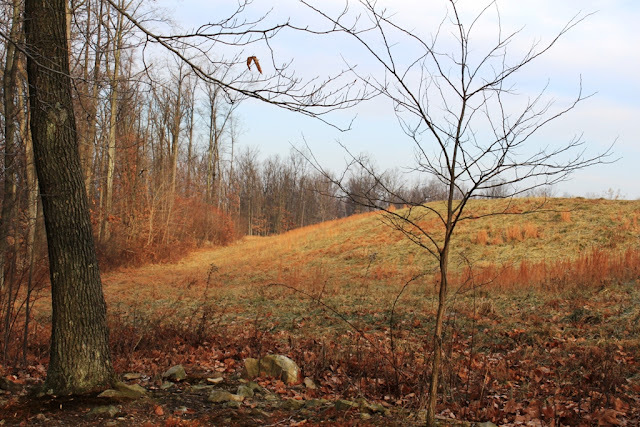 Here on Roundtop it didn’t take long for winter to settle in, plump the cushions and get comfortable, though. When I got up this morning the temperature was a chilly 15 degrees, though at least it’s no longer 15 degrees with a 20 mph north wind, which is what I had a day or so earlier. I enjoy winter, but my vision of winter is a sunny, clear day with no wind, even if the temperature doesn’t rise above 20 degrees. The thermometer could say 35 degrees, but if there’s wind you can probably find me huddled inside in front of the fire. Call me a wimp but there you have it. I don’t do wind well. Snow showers pass over my cabin this morning. I can see them coming, first covering the top of Nell’s Hill to the west. The scent of snow finds me next, even before the snow obscures the valley between us. Finally, the snow rushes up the hill, hiding one tree and then the next to reach my cabin on the side of Roundtop. It takes about 3-4 minutes (though I’ve never timed it) for the shower to arrive, which gives me time to refill the bird feeders or close the chicken pen. This year winter arrived suddenly, which made it seem like an unexpected visitor. Fall lingered on, losing strength a degree or so at a time, leading me to think that would continue. Instead, this winter visitor gave little sign of its imminent arrival, lulling me into thinking I had another week, perhaps two, to get ready for it. Guess not. It's here. 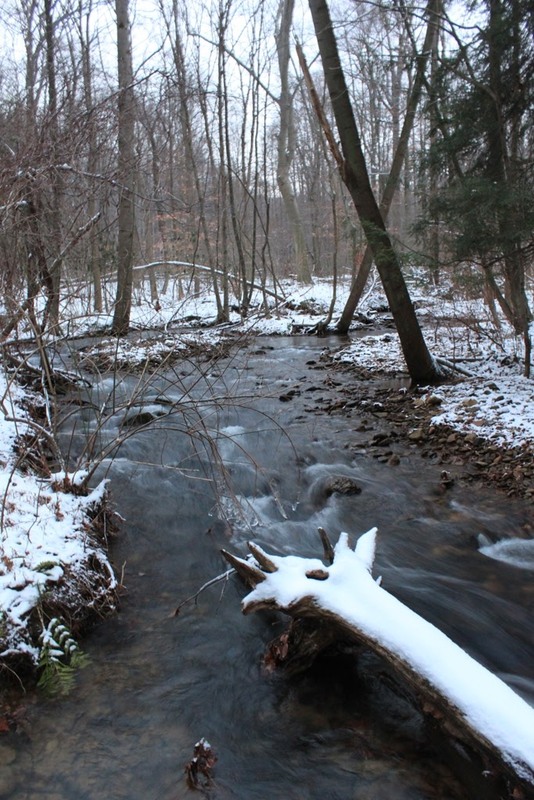 The Powdermill Creek area has a lot more snow now than when I took these photos on Saturday morning. Still, the snow I saw then was the first snow I've seen this season that was more than just a few flakes. Powdermill Creek runs right outside the door of the cabin where I stayed over the weekend. The screened-in summer porch would be a great place to sit and watch the water flow by. 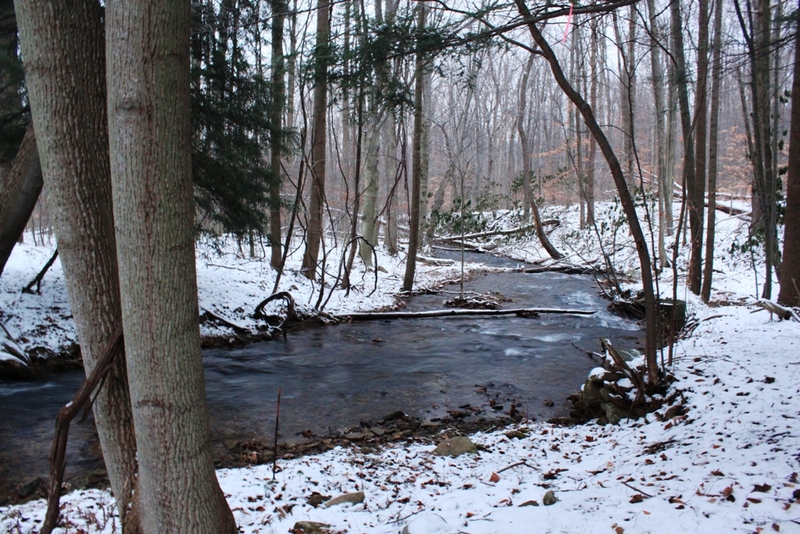 In 20 degree weather, I didn’t spend any time sitting on the porch, but I did wander around the stream for a little bit. The creek was running full and burbled loudly, so that the only bird song I heard was the scolding from a single chickadee and the sound of a singing cardinal somewhere in the distance. 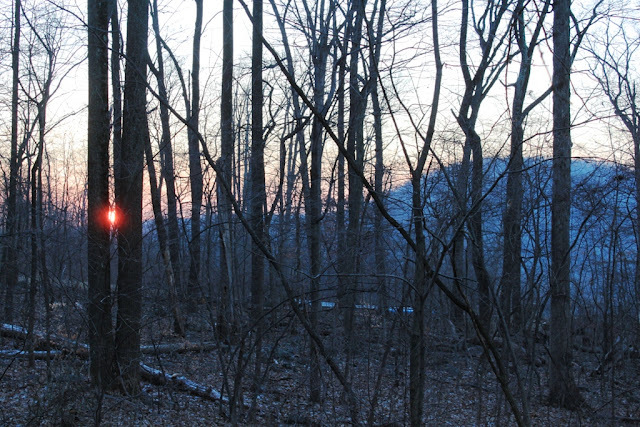 Deer hunters were out and about, too, which could have contributed to quieting the forest animals. Several huge hemlocks shaded the cabin and the creek, a welcome sight. Hemlock is Pennsylvania’s state tree, and we are losing many of them to a fungus. I hope they don’t go the way of the American chestnut tree. I have 200 year old trees around my own cabin, and these hemlocks were larger than those, so I would not be surprised if these turned out to be 300 year old trees. For the moment, these looked healthy, and I hope they remain as strong and beautiful as they are today. I am just back from a weekend trip to Powdermill Avian Research Center, which is a part of the Carnegie Museum of Natural History in Pittsburgh. The research center and nature center is located near the town of Rector, PA. 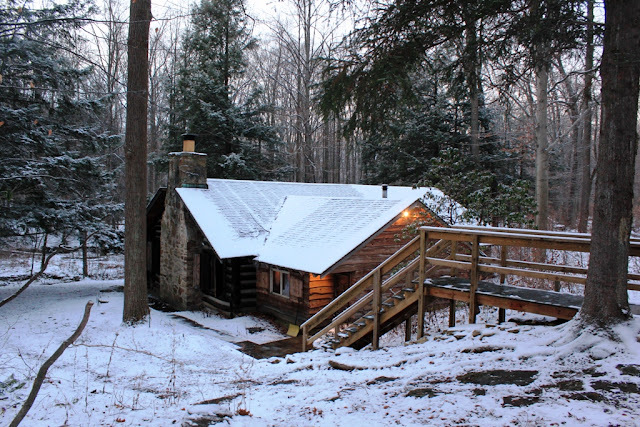 I was attending the annual board meeting of the Hawk Migration Association of North America and was fortunate enough to be one of six people who stayed in this sweet little cabin, which is owned by the research center. 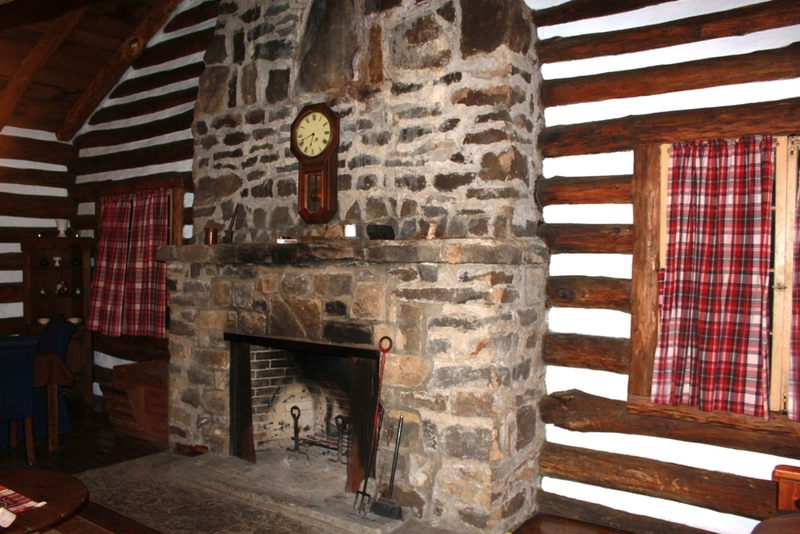 The cabin is located along Powdermill Creek and to reach the cabin we first had to get a key to the gate. Then we drove back an unplowed, very narrow and steep dirt road for about a mile to reach the cabin. As you can see from the first photo, when we arrived there wasn't all that much snow, but snow continued to fall (and mostly melt) on Saturday. Sunday morning, the area was supposed to get 8 or more inches of snow, so we ended up leaving early, which was a shame, as I would have enjoyed some hiking and more birdwatching than I was able to do. The inside of the cabin was very sweet, too, making me a tad jealous, and except for the lack of any cell phone service, let alone high-speed internet, I was ready to move right in. The screened in summer porch was pretty nice, but we didn't get to enjoy that, as the temperature hovered around 20-25 degrees the entire time we were there. The upstairs was a loft with several beds. Downstairs were two bedrooms with two beds each. 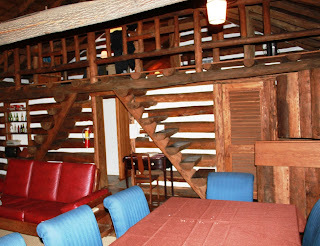 We were very comfortable, even though we didn't get to spend all that much time inside the cabin. The storage in the kitchen was impressive, and I was more than a bit jealous of all that space, not to mention the way the storage was constructed so that everything was built in, and what looked like a lovely wooden wall was actually entire wall of storage with various doors and drawer and a pantry. So now I am back home, faced with a very dirty cabin of my own. Oh, did I mention it? 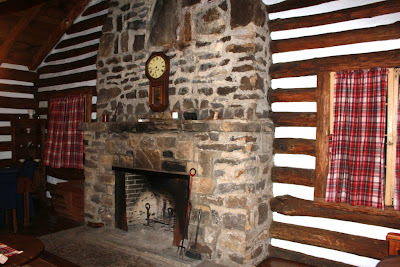 That's the other great thing about this cabin--I didn't have to clean it. Tomorrow, I'll post some photos I took outside the cabin. It was pretty sweet outside, too! Roundtop started making snow for the winter season last night. I was surprised when I got up this morning that this annual activity was underway. I hadn’t heard the guns fire up at all, not that they are particularly noisy over by my cabin. Also, the day before had reached 61 before a huge rainstorm fell on the area and the temperature plummeted by 30-couple degrees. That’s not usually a combination I think of as being conducive to snow-making. I’m not the only resident of the mountain that ignores the snowmaking. The local birds and animals seem as oblivious to the sound as I am. I did discover some years ago that it’s best not to take the dogs too close to the guns while they are spewing snow onto the lower half of the slopes. The sound hurts their sensitive ears, so I don’t walk them next to the slopes while snowmaking is underway. 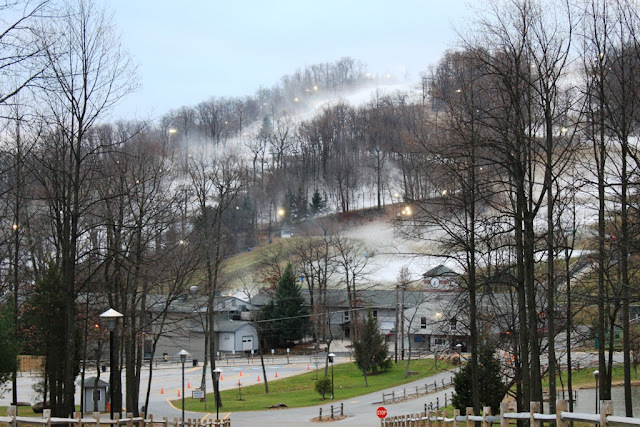 Once snowmaking is underway, there’s little point in denying that winter is here. I tend to enjoy winter, so this was a happy start to the day for me. Snowmaking is a bit like an alarm clock for me—it’s time to think about hauling out or at least checking on the condition of the cross-country skiis and snowshoes, even if there’s no natural snow in my immediate future.